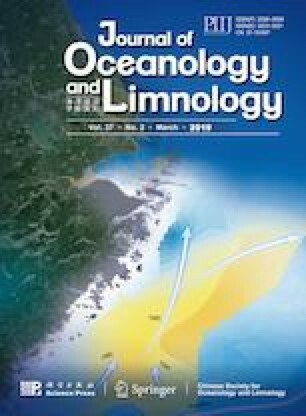 A marine survey was conducted from 18 May to 13 June 2014 in the East China Sea (ECS) and its adjacent Kuroshio Current to examine the spatial distribution and biogeochemical characteristics of dissolved oxygen (DO) in spring. Waters were sampled at 10‒25 m intervals within 100 m depth, and at 25‒500 m beyond 100 m. The depth, temperature, salinity, and density (sigma-t) were measured in situ with a conductivity-temperature-depth (CTD) sensor. DO concentrations were determined on board using traditional Winkler titration method. The results show that in the Kuroshio Current, DO content was the highest in the euphotic layer, then decreased sharply with depth to about 1 000 m, and increased with depth gradually thereafter. While in the ECS continental shelf area, DO content had high values in the coastal surface water and low values in the near-bottom water. In addition, a low-DO zone off the Changjiang (Yangtze) River estuary was found in spring 2014, and it was formed under the combined influence of many factors, including water stratification, high primary productivity in the euphotic layers, high accumulation/ sedimentation of organic matter below the euphotic layers, and mixing/transport of oceanic current waters on the shelf. Most notable among these is the Kuroshio intruded water, an oceanic current water which carried rich dissolved oxygen onto the continental shelf and alleviated the oxygen deficit phenomenon in the ECS, could impact the position, range, and intensity, thus the formation/destruction of the ECS Hypoxia Zone.